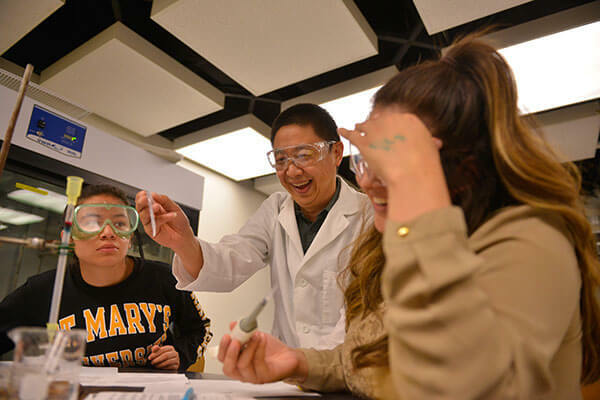 The Biochemistry program at St. Mary’s University introduces students to the chemistry of living organisms. It provides an excellent preparation for medical, dental, veterinary and allied health schools, as well as for students who choose to pursue graduate degrees in biochemistry, molecular biology or pharmacy, or careers in biochemistry and biotechnology. The Biochemistry program allows students to pursue a broad liberal arts program, while still retaining a strong science foundation. This is an excellent program for students who enjoy chemistry and biology and feel comfortable with quantitative approaches to problem solving. The program stresses not only the fundamentals of chemistry, but the development of the intellectual skills necessary to apply those fundamentals in the field. The laboratory program is based on guided inquiry and discovery modes, while the classroom emphasizes interactive learning. St. Mary’s has partnerships that can fast-track our students’ acceptance to nursing, dental and medical programs. Keep in mind that our graduates are accepted to medical and dental programs at rates much higher than the national average. For more information, view the Pre-professional Programs page.